Big Sur hiking trails are everywhere in this magical meeting of land and sea, but there are a few that are not well known and several you really don't want to miss. Most of the hikes below are on state or local park land and open to the general public, but a few outstanding hikes that many never see, are on private land and led by guides who really know Big Sur flora and fauna, and the amazing history of this unique part of the world. Miles Of Scenic Trails To Enjoy! 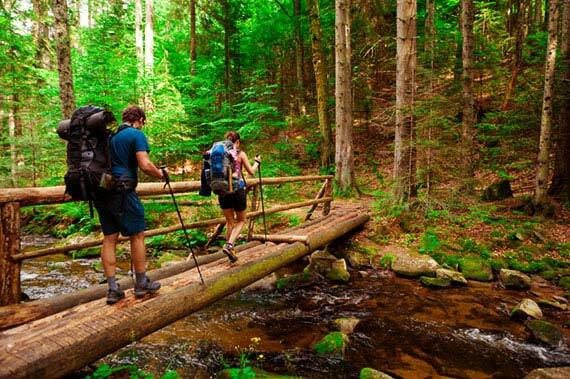 If your looking for a romantic escape where you can reclaim or strengthen your relationship, and enjoy some of the most beautiful trails anywhere in the world, throw down a blanket for a cozy picnic and good conversation followed by a scenic short hike. McWay Falls and Pfeiffer Big Sur State Park, are all the way south to the southern border of Big Sur near the Jade Cove Trail. Grab a Garrapata State Park trail map, near the picnic tables near Gate #8 and your fanny pack and maybe pause to decide if you want to linger all day on the sand, or want to take on some bluff hiking as well. A short 2.5 mile loop Bluff Trail will take you around the bluffs just above the beach and will get your adrenaline pumping. A hat, sunscreen, a little DEET in case your concerned about ticks and your on you way. The terrain is mostly level but you will notice a slight elevation climb as you near Whales Peak where you can enjoy some very nice views of crashing waves, sea stacks and the rugged coast. If you are here in spring, the wildflower make this area even more romantic. If you came here for adventurous and romantic hiking, and have the endurance to climb 1400 feet over 4.7 miles of rugged and steep trail, then take the challenge and venture on to the Rocky Ridge Trail. When you arrive near the top, you are in for a treat. Rest for awhile on the nicely placed bench, hold hands for a few minutes, and then kick back and enjoy the magnificent views all up and down the coast. When your ready, descend into Soberanes Canyon into the coolness of virgin redwood forests, lush ferns and multicolored moss. This part of the trail is steep and expect to decend about a thousand feet every mile until you reach the canyon. Hiking shoes are better here for traction especially if there have been recent rains. Hang on to your partner here because it can be incredibly slippery! This is where acres of the hillsides are blanketed with wildflowers during the early spring months of April and the first weeks of May. Scan the trail for the odd placement of cactus left by the Spanish missionaries as they made their way to the Carmel Mission. Also be on the lookout for the California Horned Lizard under the chaparral and coyote brush that is native to this area. Spotted owls reside here and rarely seen, but would make for a great memory if you were lucky enough to see one. The best access for this very popular trail are at gates #7 and gates #8. Be careful of the poison oak and wear long pants on your hike. Should We Go North Or South? Andrew Molera is a gentle place for Big Sur hiking with over twenty miles of trails, three miles of beaches and a number of camping spots ... and, it's a great place for a picnic after some enthusiastic hiking. Grab your old beach blanket and find a perfect spot for a memorable lunch. Just be sure to bring some chocolate! This is a nice beach for beach-combing and long strolls in the sand with the person you really care about. Once a cattle farm where Monterey jack cheese was made, you still see grazing cattle but this is a wide open space where casual walks, the sounds of seabirds and the roar of the ocean waves help to create a romantic attitude. There are a half dozen trails and spurs scattered along the bluffs overlooking the edge of the Pacific continent all meandering in and out of meadows and hikes that capture the best view up and down the coast. Start at the parking lot about twenty miles south of Carmel and head south toward the Big Sur River. Take the fork to the right after about a hundred yards and continue on the Beach Trail until you come to the seasonal bridge that takes you across the Big Sur River. The water here can get deep, so be careful if the bridge has not been installed for the season. Look for the campgrounds and the nearby Coopers Cabin that was built in 1861 and that continues to be the oldest structure on the entire Big Sur Coast. As you are ready to return, take the Creamery Meadow Trail back to your point of origin to finish the loop. 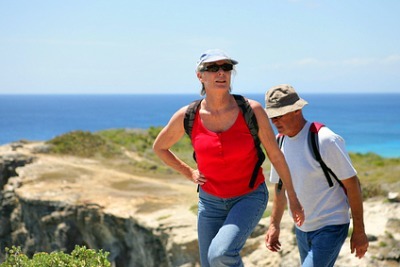 For a longer and more adventurous hike take the 8.5 mile Bluff Trail along the edge of the bluffs. If time allows take some of the unmarked spur trail down to the beach for a private walk on the sand. Eventually this trail connects with the Panorama Trail that takes you further south until you come to the park boundary marked buy a bench where you can rest before completing your loop back to your car via the Ridge Trail. The Big Sur hiking trails are well marked and you can expect a lot of privacy as you meander along the coast. There are two ways to access the McWay Falls Overlook Trail. Or, you might also pull into Julia Pfeiffer Burns State Park just across the road and pay a small $10 fee to park and hike a bit further. This is a good option if you plan to spend more time in the park and hike the Ewoldsen Trail that heads inland up McWay Creek. To get to overlook trail from the park parking lot, pass through a tunnel beneath Highway 1 to join the trail on the west side of the road. If you make the drive to the falls parking here can be limited, so if you can make the hike from Pfeiffer State Park, you have unlimited time to explore. The $10 is a good investment in the event you visit Andrew Molera State Park, Point Sur Light Station, Garrapata State Beach or Point Lobos State Reserve as you can get into all of them without additional cost, as long as it is on the same day. The parking lot at the falls itself is limited and steep. There are restrooms but those needing wheel chair access will likely need some help with the ramp. There are also a few picnic tables and is a nice spot if the wind is quiet... which is seldom unless you are here early in the morning. Gray whales can be spotted migrating past this point in December and January and reportedly even sometimes can be seen at the mouth of the cove. Enjoy Some Of The Best Hiking Anywhere In The World! Of all the Big Sur hiking trails, the Ewoldsen Trail is probably the trail you want to take if you have just a short time in Big Sur. It has everything! Rated as a 4.6 mile moderately strenuous hike with a steep climb for parts of the 1400 foot elevation gain, but if you take your time, have plenty of water, wear a hat and help each other up the twisting switchbacks, you should be in good shape. It's a popular trail, so you will occasionally have company to break the absolute silence that you feel in these lush canyons. Begin at the Pfferifer Burns parking lot and begin your assent. Watch for the first right fork in the trail and take that up through some steep switchbacks while crossing Mc Way Creek. As you gain elevation, you will be able to enjoy sweeping ocean views, the hint of aromatic California sage and maybe even see the almost extinct dinosaur-like bird known as the California Condor which is trying to make a comeback in these hills. As you pass thru the lush canyons covered in lime green sorrel it gets cooler ... a much welcome respite from the heat if you are traveling in summer. As you complete your hike consider continuing on to the McWay Falls on the other side of Highway 1 for a beautiful end to the day of hiking in the "Big Sur." If your lucky, you might catch the setting sun with the falls in the foreground. Pacific Valley Bluff Trail provides broad views of the southern coast just a couple of miles north of Sand Dollar State Beach. The trail begins along highway one. Take the gravel trail from the parking lot until you see the steps that take you up and over the cattle fence (common along the Big Sur coast) and then on to the grassy, worn and somewhat eroded trail that leads out to ocean views. An overlook spot for beautiful scenes of the entire beach area is just down the path about a mile round trip with very little elevation gain. The Cone Peak Trail is a hike only for the well prepared romantic couple who's relationship can handle a physical challenge. If you are bicyclists or well tuned back country hikers, the assent to Cone Peak is one that will leave you with an unforgettable three hundred and sixty degree panoramic view of Sand Dollar Beach and this part of the coast with some of the most beautiful views anywhere in the Los Padres National Forest. Consider this warning however. This trail is a very steep and strenuous thirty three degree climb to a ridge near the five thousand five hundred foot peak. Don't hike this trail alone and without the right equipment ... hat, water, map and long pants, as rattlesnakes and poison oak are sometimes near the infrequently hiked trails. Cone Peak affords the only view in Big Sur from this elevation. It is a lonely trail that is best climbed in the early fall as the access roads are closed from November to May and at other times as well to motorized traffic. Was That A Humpback or Grey Whale? From the Highway and the Jade Cove Beach Recreation sign, your Big Sur hiking adventures begins at the Jade Cove Trail. Take the very short trail from the parking lot along the steep cliffs and then down to explore Jade Cove. On your way keep an eye out for passing humpback whales and their offspring that tend to swim very close to shore. After you have explored the beach and looked for some jade, climb back up the cliff and then turn north toward the Plaskett Rock Trail which will take you to a westerly point where you can savor even more incredible views. Return back to the north parking lot where you will see a grove of trees and then take the trail parallel to the Hi way back to your car at the southern parking lot. The ocean views are incredibly relaxing. Sounds of crashing waves and seabirds fill your thoughts and as you turn to look north, the Santa Lucia mountain range sweeps up the coastline as far as you can see. The setting inspires you to cuddle up and linger for awhile, as you think about the rest of your adventure here, and the importance of this time together as a memorable and romantic outing. 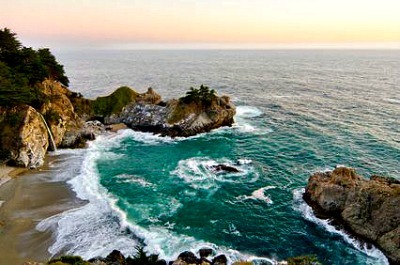 A perfect beach AND great Big Sur hiking! If the idea of twisting canyon trails, green and blue vistas, waterfalls and redwoods six and seven hundred years old appeal to you, then consider the Robinson Jeffers hike with a seasoned guide and a mountain experience that leads you down to multiple shades of blue at the oceans edge... a guided trip to see what others amost always miss. Groves of ancient redwoods, secret waterfalls and multiple shades of green abound everywhere on the Walk Of The Married Redwoods all framed with stories of natural history, and the legacy of the Esselen Indians that viewed some of Big Sur near the Ventanna Inn and Spa as sacred ground...and a surprise at the end of the trail. See a secret waterfall on the Waterfall Walk that sits on private land that few people have ever seen. Stop with your guide and enjoy a picnic only a few hundred yards offshore and watch for the frequently seen harbour seal, and if the time of the year is right, maybe even a California Grey Whale ... all while enjoying the ever changing colors of blue and green no matter where you turn. This experience is not to be missed! Stephen Copeland is a man that has much to say about the beauty of Big Sur. He founded Big Sur Guides in 1971 and has a huge staff catering to those who want the "real" Big Sur experience. Visit ancient redwoods and one of a few place on earth where you can see a rare ancient redwood ring of trees that the native Indians regarded as a sacred place and used as a temple where marriages and burials were held. You will hear Stephen tell of the story of the majestic redwoods and how each tree releases up to 10 million seeds with the expectation that only 1 or 2 will become a full grown tree. In this scared place revered by the Esselen natives, when a redwood tree dies, a unique set of seeds are released and most if not all flourish ... a continuation of the circle of life. Featured in USA Today, The San Francisco Chronicle and the San Jose Mercury News, Stephen has Big Sur hiking covered. You may choose to be part of a small group or request a private guide for your outing. in the woods. Most who visit echo the feelings of many who feel tiny and dwarfed and somehow humbled by their experience. Over 20 tours are offered and many come back again and again. If your lucky, you will be able to see and maybe even pet a yellow banana slug the size of, well, a banana. Stephen and his crew of 38 coordinate with dozens of local hotels up and down the coast. Some roll in the price of tours into their package prices. Tours leave daily at the Ventanna Inn and Spa lobby at 11:30 AM. Small groups are about $75 and private tours at $120. There is a picnic lunch option for another 15 bucks and it's worth it. Share a little with the banana slugs you see on the way. Big Sur hiking is one of those things you will never forget, and you will surely kick yourself if you don't find time for it. Whether you choose a guided tour to places not often seen by the thousands who visit this area, or a private... contemplative walk along the ocean bluffs... just go! You won't be disappointed ... seriously!